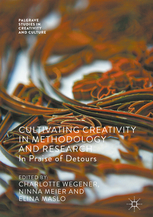 The collection Cultivating Creativity in Methodology and Research: In Praise of Detours, edited by Charlotte Wegener, Ninna Meier and Elina Maslo, is comprised of short essays that offer imaginative detours from conventional academic wisdom to reflect on lived experiences of research. While the volume at times risks emphasising the unhappy aspects of academic life over and above the potential for creativity, writes Ignas Kalpokas, many of the chapters contain interesting reflections and will serve a therapeutic function in giving voice to shared struggles and experiences in the academy. Cultivating Creativity in Methodology and Research: In Praise of Detours. Charlotte Wegener, Ninna Meier and Elina Maslo (eds). Palgrave. 2017. As far as methodology books are concerned, Cultivating Creativity in Methodology and Research: In Praise of Detours is completely in a world of its own. In fact, it is entirely faithful to the second part of the title: it is composed of 19 detours from conventional academic wisdom, even though they differ in the extent to which the contributors distance themselves from the mainstream (they vary greatly in their quality as well). Significantly, this is also an insight into the collective psyche of some very troubled researchers – a kind of academic autoethnography that can, at times, read a bit like the comics about frustrated (usually postgrad) researchers circulating on academic social media. It must be stressed that the term “methodology” in the first part of the title might be somewhat misleading: even though there is an occasional take on methodology as such (and, even then, mostly in terms of reflecting on a method), the main focus of the book appears to be on research as a lived experience, and a largely traumatic one, judging by the contributions. However, that might be exactly the case – representing the pressure and challenge to abide by the highly formalised requirements with which today’s researchers are burdened, including the necessity to always know one’s exact topics, questions and methods, quantify impact or follow strict language and content rules. In fact, the essence of this volume is perhaps best captured in the opening paragraph of a chapter by Rasmus Hoffmann Birk: “I will […] give no instructions of tips on how to be creative, nor how to produce innovative, ground-breaking or novel research” (93). Rather, in this chapter, as in the entire volume, the author intends to “tell a story about wrestling with feelings of anxiety and worry about not producing innovative, novel and creative research”, while also implying that such personal struggles are typical of the contemporary academia as such (93) – and they, in this reviewer’s opinion, truly are. 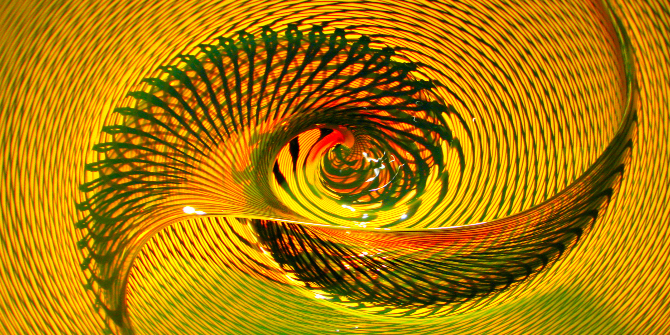 Image credit: Infinite Spiral Well by Benjamin Esham. This work is licensed under a CC BY-SA 2.0 license. It must be made clear that the chapters, for the most part, do not aspire to tell the reader anything immediately useful, at least not in the sense of immediate takeaways or detailed instructions that can be applied straight away in the reader’s own research. In fact, there is a more likely therapeutic function, since there might be consolation in discovering how universal the pains and frustrations that one is facing actually are. However, there often also is a deeper layer that has to be discovered through reflecting back on what one has read. Chris Smissaert’s account of talks with his daughter is characteristic here: while banal on the surface, it is both a reflection on responsibility (through the use of the classic technique of a child interlocutor who is simultaneously naïve and, though such naivety, more insightful than the adult) and an appraisal of basic research practices. Lene Tanggaard’s contribution on boundary crossing, meanwhile, directs our attention towards the permanence of an academic’s working life: contrary to many other professions, an academic’s “work” is not confined to formal settings, such as their office or a classroom – rather, the thought process goes on all the time. And while that is often vilified by academics themselves, Tanggaard puts at least a partially positive spin on this: it is those spaces outside formal bounds that stimulate and inspire creativity. The chapter therefore urges us to consider possibilities for an academic’s freedom to roam instead of confining them to a workplace (e.g. an office) for clearly defined working hours in the manner of a traditional employee. In terms of crossing boundaries, art also features heavily in the contributions: one immediately encounters detours to art as an instrument in research (Lone Grøn) or artistic practices as an escape from the shackles of formalised academic research (Christina Berg Johansen). There are also interesting reflections on what could loosely be called the setup of research. Karen Ingerslev, for example, questions the privileged position of scientific research in knowledge creation, advocating instead a much more hands-on real-life engagement, while Birk, in his abovementioned chapter, explores the trends that preclude such immersion – the quantification of science through outputs, impacts and other metrics that herd academics into a permanent publishing mode without leaving any time to stop, think and do something else. However, the publishing process is rarely straightforward, and this is addressed in one of the most interesting and important contributions to the volume, by Sarah Gilmore and Nancy Harding. Their chapter debunks the idea of a journal article as a result of a straightforward linear process in which the researcher always knows what they are doing. Instead, the authors claim in describing their own writing process that a journal article is constructed haphazardly as a result of various changes of heart and mind and, of course, detours. A similar story about “the façade vs. the real”, here in relation to fieldwork, is conveyed by Ninna Meier and the chapter by Constance de Saint-Laurent. While many experienced researchers will probably have discovered this the hard way already, for those at the beginning of their research journey this chapter will undoubtedly be encouraging: even if your own research seems to be a bit of a mess, this is how it tends to be anyway. The volume itself is true to its title in the sense that there is little coherence in subject, scope, methodology or substance: it is composed of multiple detours instead. However, this endless reiteration of personal struggles and frustrations can ultimately become frustrating in itself. There are some immensely interesting and useful contributions, but there are also others that could have easily been edited out. The most prominent example would probably be the chapter by one of the editors, Charlotte Wegener: moving between the epistolary and the autobiographical while also minimally referring to the birth of a book, this chapter leaves a reader with few takeaways except for some snapshots from the author’s personal life. Hence, perhaps the most significant contribution of this chapter is the demonstration of the difficulty of self-editing. Elsewhere, Ken Gale and Jonathan Wyatt describe relatively straightforward collaborative processes in unnecessarily difficult language that involves, among other things, detours to Friedrich Nietzsche as well as Gilles Deleuze and Félix Guattari, leaving one wondering whether this is a form of self-indulgence. To an extent, therefore, the volume can be considered overdone: fewer contributions that actually pack a message (which, perhaps with the exception of Noomi Matthiesen’s reflection on procrastination, would mean discarding Part Four) would leave the entire purpose of the book clearer and more coherent while still conveying how miserable life in academia can be (without leaving the reader utterly depressed). All in all, this book is a must-read for anyone contemplating the option of joining the academy, but one that has to be read selectively: some chapters will leave one better informed while the whole book will make one run away as far as possible from the very possibility of contemplating academic life. It is also a useful therapeutic tool for those already doing research who need reassurance that their troubles are not due to individual deficiency while perhaps learning a few tips from others’ experience. However, the final paradox of the book is this: despite the nominal celebration of creativity and detour, the volume manages to even reinforce the stereotypical and highly uncreative image of the academy (and of PhD studies in particular) as overwhelmingly stressful and of academics as perpetually victimised individuals. Which, in the reviewer’s opinion, is not fair: there are joys even in academia. Ignas Kalpokas is currently assistant professor at LCC International University and lecturer at Vytautas Magnus University (Lithuania). He received his PhD from the University of Nottingham. Ignas’s research and teaching covers the areas of international relations and international political theory, primarily with respect to sovereignty and globalisation of norms, identity and formation of political communities, political use of social media, political impact of digital innovations, and information warfare. He is the author of Creativity and Limitation in Political Communities: Spinoza, Schmitt and Ordering (Routledge, 2018). Read more by Ignas Kalpokas. and gives the author considerably more freedom to continue her/his search for innovation.